Felling large pine trees is a skilled job. 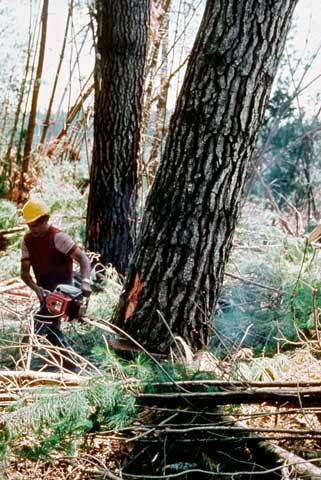 In New Zealand forests the work is carried out by experienced crews trained in felling and safety techniques. This feller has selected the direction the tree will fall by cutting a shallow notch (scarf cut) on the far side of the tree. He is just removing the saw from the deep back cut that causes the tree to fall.